144 is a composite number and a perfect square. Factor pairs: 144 = 1 x 144, 2 x 72, 3 x 48, 4 x 36, 6 x 24, 8 x 18, 9 x 16, 12 x 12. Factors of 144: 1, 2, 3, 4, 6, 8, 9, 12, 16, 18, 24, 36, 48, 72, 144. Prime factorization: 144 = 2 x 2 x 2 x 2 x 3 x 3, which can also be written 144 = (2^4) x (3^2). 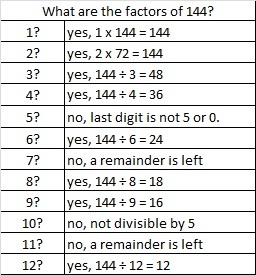 144 is the largest clue that appears in the FIND THE FACTORS 1 – 12 puzzles. For the puzzles in which it is a clue, always use 12 x 12 as the factors.